At the beginning of June, there was talk that Boston Manager John Farrell’s job was in jeopardy. After all, the BoSox were floundering at 29-25 and there had been episodes of friction between him and some players (such as with Drew Pomeranz, as you can see in the video below). However, a 10-5 run has seen Boston pull into a tie for first in the AL East, likely stemming rumours of his demise — for now. So if Farrell is currently safe, who’s in trouble? The Mets are playing better lately, so we’re going to assume Terry Collins’ job is not in question. If their pitching gets healthy, they should be in the NL Wild Card race; if not, we’ll re-evaluate his job security, especially in light of all the off field craziness surrounding that team recently. No, if we had to pick the first manager to get fired this season, it will be back in the AL, specifically in Motor City. Detroit’s Brad Ausmus has to be sweating right now with his Tigers in free fall, recently slipping behind suddenly rejuvenated KC, with the White Sox heating up and about to push the Cats into the cellar. Clearly, it’s time for a new look in the dugout. 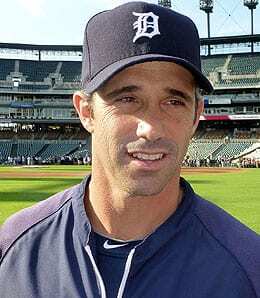 If the Tigers keep sinking and decide to divest themselves of Ausmus, who might they peg to replace him? Ideally, it would be someone with more experience than Ausmus had (zero). Don Wakamatsu has been the bench coach of the Royals since after the 2013 season and previously managed the Mariners to a .464 winning percentage over 274 games in 2009 and 2010. He could be the first choice of just about any team that has an opening, but would the Royals allow a division rival to hire him away? That may not work. Boston hitting coach Chili Davis is considered ready for a managing gig, but without any experience, he may not be Detroit’s best bet. This veteran team may need a veteran manager to turn it around. San Francisco bench coach Ron Wotus is in the same situation — a man that’s coached in a winning environment that’s ready for his own team, but has no big league managing experience. Still, with seven years as a minor league manager, he’d come to the job far more qualified than Ausmus did. Florida bench coach Tim Wallach is in a similar situation, and has long been touted as a managerial candidate. He does have managing experience at Triple-A; in fact in his only season there in 2009, he was PCL Manager of the Year. Wallach is considered one of the good guys in the game. If you’re going to take a chance on a manager without big league experience, we like this choice. Chip Hale is a similar candidate to Wakamatsu, having spent two full seasons guiding the D-Backs to a substandard record. Hale has tons of minor league managing experience and lots of MLB coaching time, in addition to his managing background. He seems to be being underutilized in Oakland, so would welcome a change. Cubs bench coach Davey Martinez is another coach that’s long been ready for his crack at managing. He’s tasted winning environments, but we believe what’s holding him back is his lack of minor league managing experience. Giants’ third base coach Phil Nevin is another strong candidate, one with a history playing for the Tigers and managing in their minor league system. He’s had a crack at big league managing positions but is still looking to land his first gig. Toronto bench coach DeMarlo Hale has also been knocking on the door of a big league managing gig for a long time, and probably has more managing experience than anyone on this list, just not at the big league level. Cleveland first base coach Sandy Alomar Jr. was given all of six games as the interim manager of the Indians back in 2012. It’s time for him to get a real shot, as it’s been some time since he had an opportunity to interview for a managing position. For our money, we like either Hale, Wallach or Nevin as the next manager of the Tigers, a search we expect to begin very soon unless Detroit suddenly gets hot heading into the All-Star break. Now it’s your turn. Let us know in the comments below what you think will happen with Ausmus, and who might replace him if he gets axed. September 23, 2016 | by RotoRob | Comments Comments Off on Is This Cleveland’s Year? Posted in BASEBALL, RotoRob, Team report | Comments Off on Is This Cleveland’s Year? The Chicago White Sox have slumped a bit recently, dropping six of their last 10 to fall into fourth place in the AL Central, a half game behind Detroit. Every year it seems the Dodgers find these hurlers that no one has ever heard of, and they wind up providing surprising value at times. Stripling is the latest example, tossing 7 1/3 hitless frames in his big league debut on Friday. The Dodgers’ fifth round pick from 2012 has shown tremendous command in his minor league career, although — ironically — it was spotty in his otherwise sterling big league outing. Having tossed 100 pitches, Stripling was yanked from what could have been a historic debut. He’s just as likely to be throttled in his next outing, so don’t overpay for him, but if you need pitching help, he’s worth grabbing to see how this plays out.